I am an end user, where can I get SuperFlash's Products? You can get these from any authorized SF distributor. Call us to find out who carries SuperFlash products in your area! What's the difference between a flashback arrestor and a checkvalve? A flashback arrestor contains a check valve, but a check valve is not a flashback arrestor. A check valve is a one way valve that allows gases to flow only in one direction. A working check valve will not allow gases to flow back upstream and past the check valve. However, a check valve will not stop gases from flowing back upstream if they are ignited. Mixed gases that are ignited create flashbacks and a check valve cannot stop this. 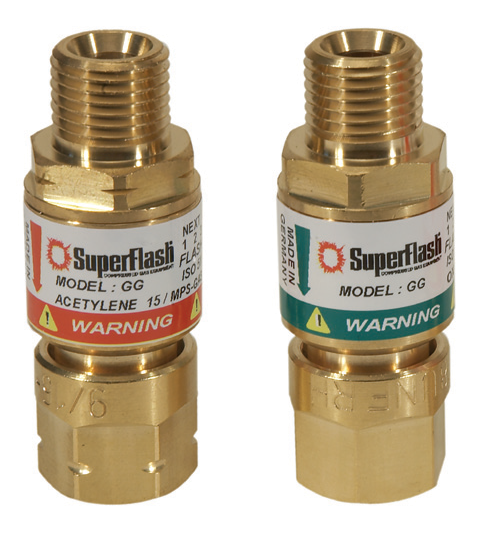 A flashback arrestor contains a check valve to stop the reverse flow of gases, and additionally contains a flame barrier that will extinguish ignited gases (flashbacks) prior to the flame getting to the check valve. SuperFlash is looking for new distributors. Please contact us at sales@oxyfuelsafety.com for more details. I need a very specific product for a very specific application. I don't see it on your website. How do I find out if you have it? SuperFlash can accommodate many special requests via our engineering and R & D departments. Simply contact our technical support team at tech@oxyfuelsafety.com with your technical question(s) and we will respond to you in a timely manner. I don't see the product I want with the connection I want. What can I do? SuperFlash manufactures and sells products in over 100 countries. We have a wide variety of connections to meet the different needs around the world, and chances are we have the connection you require. Please contact our sales team at sales@oxyfuelsafety.com with your requirements. What gases can your gas mixers blend? 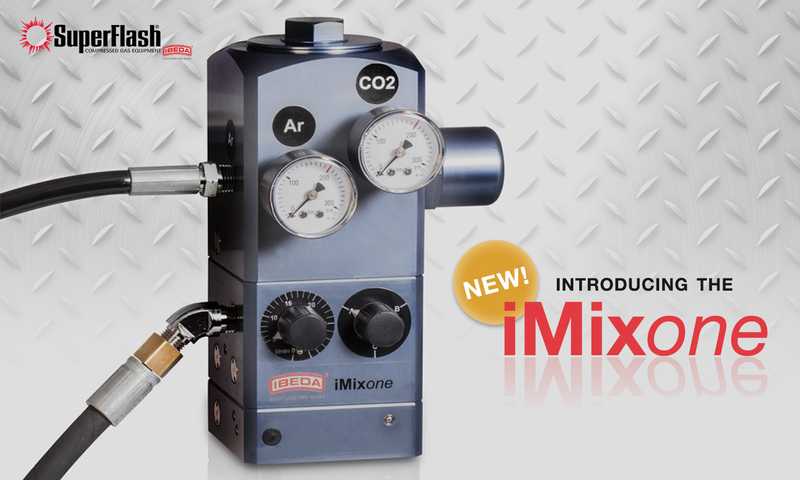 SuperFlash’s gas mixers can blend many combinations of two gas mixtures including Argon/CO2, Argon/Helium, Argon/Oxygen, Compressed Air/CO2, Hydrogen/Nitrogen and more. Don’t see the particular blend you need, just contact us at sales@oxyfuelsafety.com with your mix to see if we can meet your requirements. How often do I have to replace my flashback arrestors? See Spark’s answer on his welding poster. SuperFlash ( "Seller") offers Net 30 days billing to customers with established credit. Visa, Master Card, American Express credit cards accepted at time of shipment without a service fee. A service fee of 3% will be charged to customers for payment other than time of shipment. An interest penalty of 1.5% per month will be charged to delinquent accounts. Delivery on all orders shall be F.O.B. shipping point, unless specifically agreed upon in advance; Seller will select the carrier and route. Quotations: All quotations are for immediate acceptance unless otherwise stated and are subject to correction for clerical error. Minimum Order: A minimum charge of $9.95 will be applied to orders under $50.00. The seller will not accept returned goods without prior approval. Buyer shall obtain an RGA (returned goods authorization) NUMBER from Seller. In order to receive credit, all items being returned for reasons other than the faults of Seller (as determined by Seller) will be subject to RESTOCKING CHARGES. Certain products including special and obsolete items cannot be returned. All returns must be shipped F.O.B. destination for credit. Contact Seller upon receipt of shipment to report and shortages of shipment and/or damages. SuperFlash (herein "the Seller"), all products and systems (“items”) sold by the Seller are warranted for a period of one year from the date of shipment to be free from defects in material and workmanship to conform the Seller's written specifications applicable to the items. All services and labor are warrantied for 90 days from date of service. Consumables or parts designed to wear out and be replaced are excluded from the one year warranty. The Seller's liability on this warranty shall in no event exceed the cost of correcting defect proven in the items sold or at the Seller's option, replacing the same. No other warranty, express or implied (including without limitation the warranty of merchantability), shall exist in connection with the design, manufacture, sale or use of any parts sold by the Seller. A. Failure or damage due to misapplication, abuse, improper installation, or abnormal conditions of use, temperature, moisture, dirt, pollution, or corrosion. B. Items which have been in any way altered after leaving the possession of the Seller. C. The fitness of the items sold for the purpose or use intended by the Buyer, or the performance thereof. D. Items damaged in shipment or otherwise without the Seller's fault. E. Expenses incurred by the Buyer in procession any items prior to discovery of alleged defect or in attempting to correct same. F. Losses, costs, liabilities, and damages which might be claimed from the use, misuse, or failure of any items delivered, including (but without limitation to), loss of use of profits, all liabilities incurred by the Buyer to the Buyer's customers or third persons, and all other consequential damages, where direct or indirect, and whether or not resulting from, or contributed to by the Seller's default or negligence. G. Failure or rejection of parts due to incorrect specifications and/or design parameters supplied by the Buyer. All claims for defects in material or workmanship will be deemed waived, if not presented within 30 days after receipt of shipment. Upon notice of any such claims, the Seller will have the option, to be exercised at once, either of inspecting any alleged defective parts in the Buyer's hands or of requesting their return to the Seller. The Seller will at the Seller's option, either repair, replace, or give the Buyer proper credit for parts determined by the Seller to be defective. The Seller will not be liable for damages or losses resulting directly or indirectly from the use or resale by the Buyer of defective parts, nor will the Seller be liable in any way for the Seller's items which have been further processed by the Buyer. The Buyer may not return parts without authority from the Seller and the Seller will not be liable for transportation charges, if parts are returned without the Seller's authorization. The remedy herein above provided for breach of our warranty shall be exclusive.